As 2017 comes to a close, here’s another holiday-related recollection that comes to mind. It’s from the time I was in Papua New Guinea on my way home to the United States following Peace Corps service in India. What, you might ask, does this have to do with the holidays? Hang on. You’ll find out. As I wrote in a recent post about culture shock, upon leaving India in January 1971, I traveled eastward, thinking I might never again have a chance to see something more of Asia. In addition to Papua New Guinea, I spent anywhere from a few days to a week or more in Nepal, Burma (today called Myanmar), Thailand, Laos, Malaysia, Singapore, Indonesia, East Timor, Australia, Hong Kong, Macau, Taiwan and Japan before flying home to the U.S. Unlike all the other countries I visited on my Asian adventure, for my visit to Papua New Guinea I was strongly advised to sign up for a tour. I got this advice in Australia – the previous stop on my itinerary – from any number of Aussies who’d been there. (At the time, 1971, Papua New Guinea was still under Australia’s colonial administration; it gained independence the next year.) So, while I was in Sydney, I went into a travel agency and purchased a tour, making sure the itinerary included visits to the Highlands and the lower Sepik River, where I knew I’d get to see the Stone Age. As it turned out, when I flew into the capital, Port Moresby, on the island’s south coast, a tour guide met me at the airport and told me I was the only person on this particular tour. That proved helpful when, several days later, I wished to tweak my itinerary. Circling in a small plane for a long time above Mount Hagen, in the Highlands, while the pilot looked for a hole in the clouds through which he could descend to the dirt runway. After nearly turning back as fuel ran low, he finally dropped through a small opening – visibility was essential because the airport was surrounded by mountains. 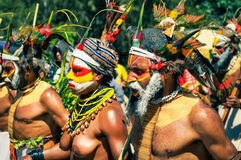 Grass skirts, pierced noses, face paint, feathers, bare breasts, boars’ tusk necklaces, and another type of necklace – this one made up of a lengthy chain of thin, pencil-like cassowary bones attached to each other lengthwise and horizontally, each one of which, I was told, represented a debt that someone owed the wearer. Those with particularly long necklaces of this kind were considered wealthy, since they were owed many debts. 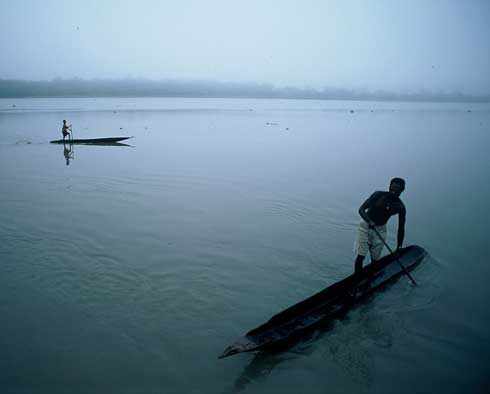 For me, though, the most memorable part of the trip was a visit to the lower reaches of the Sepik River, on the island’s northern coast. When the plane arrived at the local airstrip, I was met by the Australian proprietor of a lodge in the jungle. I was scheduled to stay there for two days. For the first hour or two, I found myself sitting at a bar sipping beer with several Aussie expats. I asked about the tour program and discovered that my time there was basically intended to be spent at the bar. This was a far cry from my desire to see something more of the Stone Age. When I told the hotelier what I was interested in, he arranged an alternative program. As a result, I wound up spending no nights at all at the lodge. Instead, I was given a ride downriver in an open motorboat, all the way to where the Sepik empties into the Bismarck Sea. The boat was driven by a youngster, I’d guess about 15 years of age. We motored down the river all day, passing numerous villages whose houses sat on stilts – pilings driven into the shallows near the riverbank. We passed any number of local people traveling the slow-moving lower river in dugout canoes – hollow logs – propelled by long poles pushed against the river bottom. The prow of each of these canoes was shaped like the snout of a crocodile, in apparent homage to the voracious reptiles that inhabit the river. 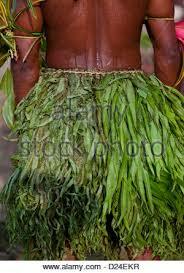 Poling down the Sepik in a hollowed-out log. Note crocodile-snout shape of the prow. What most astonished me was the sight of small boys – perhaps just 6 or 8 years old – standing alone in one of these canoes, poling along, perhaps to a friend’s house, or on an errand for Mom or Dad! I repeat: Standing, not sitting. Alone. In a hollowed-out log, probably the least stable watercraft imaginable. In croc-infested waters. It took my breath away. That night, we made it to the mouth of the river. There we slept in a simple wooden hut on stilts right behind the beach. A “government guest house,” my young guide called it. It had no facilities whatsoever. We slept on the floor. I don’t remember what we ate. In the morning, we started back upriver. The most memorable moment of that journey was a rainstorm, which prompted my guide to steer the boat to a thatched hut by the riverbank. He knew the people there, and we were invited inside. A woman was baking flat bread in a circular pan over an open fire. The bread, made from sago palm flour, was warm and delicious. A wonderful cultural experience. And to think, I could have spent the time quaffing beer with the Aussies. Not Your Everyday Christmas Story Refuge for Birds, or …?